I was interested to find out a few days ago that the fashion retailer Peacocks will soon be opening a store in my old home town of Tamworth, taking a prime spot within the town centre’s Ankerside mall. 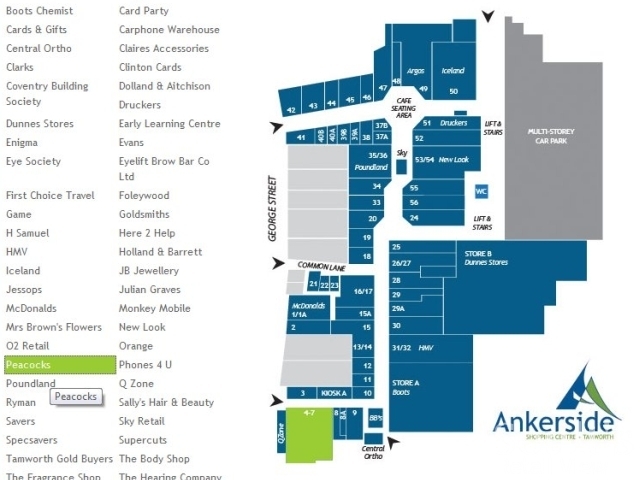 Given that jobs in the store have been being advertised since June, and with the store listed as ‘coming soon’ on Ankerside’s own website, it’s hardly entirely new news. However, it was the first my mother – who still lives in Tamworth – had heard about it when I quizzed her earlier this week. Peacocks opening up in Tamworth may not sound like a revelation, but new investment from a major retailer is really positive news for a town centre that has struggled to compete with the out-of-town Ventura Park complex down the road. 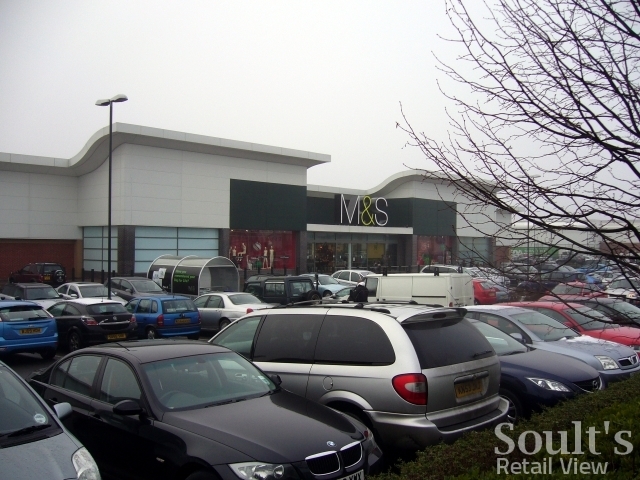 Some retailers – including Currys, Comet, JJB Sports, Mothercare and WHSmith – long ago closed their town centre sites in favour of Ventura Park, while others, like M&S, Next, Blacks and TK Maxx, have chosen to open up on the retail park instead of in the town centre. Even those major names who are represented in the centre of Tamworth often have a Ventura Park store as well, such as Argos, Boots and (soon) New Look. 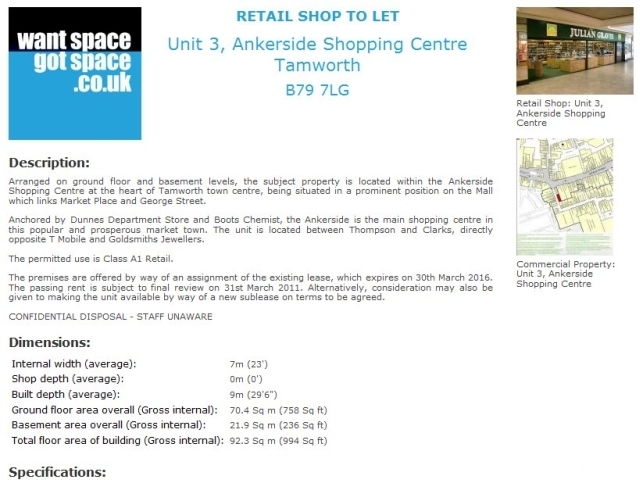 Part of the problem has been Tamworth town centre’s chronic shortage of large, modern retail units. 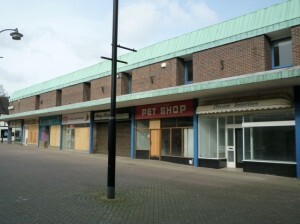 I’ve always thought, for example, that Peacocks, Primark and Bhs would all do well in Tamworth if only they could find the space. 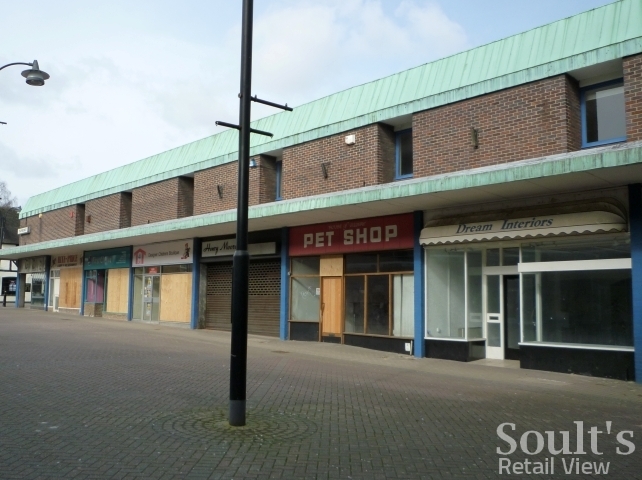 However, the only large unit to have become available in recent years is the old Woolworths in George Street, eventually snapped up by Home Bargains. 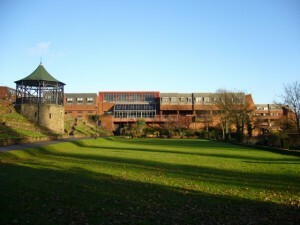 Prior to that, the most significant new arrival was Wilkinson, in 1994. Moving back to the town after some years away, Wilko’s also had to be creative in finding space, carving out a new unit for itself in Market Street from a former Berni Inn (The Peel Arms) and the adjoining car park. 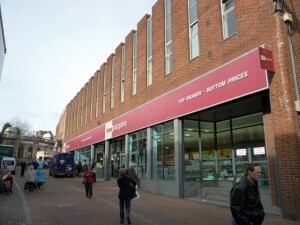 Even in the relatively modern Ankerside – opened in 1980 and extended in 1992 – only two of the 60 or so stores are really large units: Boots, which has occupied the same site since the centre opened; and the privately-owned Irish fashion retailer, Dunnes, which took over the site that originally housed Sainsbury’s. 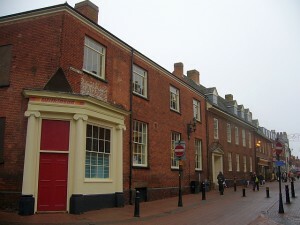 Most of the other units are very small by modern standards, keeping Tamworth well provided for with mobile phones and greetings cards, but little else. To get over this problem, there have been several instances in the past where Ankerside has knocked units together to create larger, more attractive spaces. 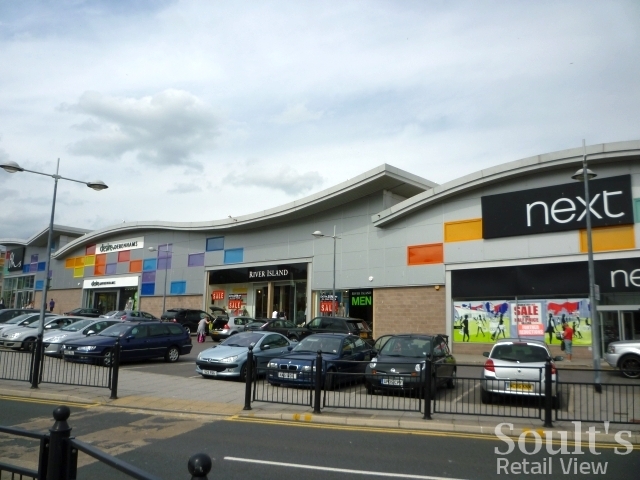 If I recall correctly, both New Look and Clinton Cards started off in single units, before expanding into the ones next door; similarly, the current Poundland site – previously MK One – was knocked together from two units in the 1990s to accommodate Mothercare. In due course, Henry Boot’s Tamworth Junction scheme, a planned £75m redevelopment of the town centre’s old Gungate Precinct site, should provide Tamworth with room for some large stores; indeed, the same developer’s success in signing up Next, Desire by Debenhams, Bhs and River Island for South Shields’ Waterloo Square scheme surely bodes well. However, it is still likely to be several years before Tamworth Junction reaches fruition. In the meantime, all Ankerside can really do is continue making the most of the space that it’s got, with the three units closest to Ankerside’s top George Street entrance (numbers 4 -7) being combined to form a more viable space for Peacocks. Unit 7 has recently housed a couple of short-lived fashion retailers (Gimme 5 and Bells Clothing), after previously being a branch of Select. The resulting store will, I believe, have a ground-floor sales area of just under 5,000 sq ft, or around half that of the nearby Boots shop – a decent size, but still quite compact by Peacocks’ standards. Prompted by my news, my mother duly went into town for a recce a couple of days ago, and reported that while there was some banging going on behind the scenes, there was no visible sign yet of the three units being combined, with no hoardings, and no signs proclaiming Peacocks’ impending arrival. This all suggests that it may be October or November before the store opens, assuming that the retailer is keen to be trading in the run-up to Christmas. Given the revolving door of underwhelming tenants at that end of Ankerside, it’s clearly a very positive step to be welcoming a relatively big-name retailer that is likely to stick around for a while – unless, of course, Peacocks does so well it decides to upgrade to a larger site at Tamworth Junction. Absurdly, the advertisement contains the wording “Confidential Disposal – Staff Unaware”, despite the fact that it’s easy to find on Google (simply by searching for “3 ankerside”) and – just in case you were in any doubt – includes a prominent photo of the current occupant. pure laziness i’m sorry :) i was on my way out to work and wanted to say before i forgot. Perhaps it’s going to become an Alworths? I talked at http://www.soultsretailview.co.uk/2010/07/22/alworths-comes-to-llandudno/ about how Alworths seems to be snapping up quite a few ex-Woolies sites that were briefly occupied by other retailers – including, as it happens, Well Worth It (no relation, I think) in Hertford. not relevant to this post, but did you hear that Well Worth it in Wallsend is closing down? i was in Wallsend on Saturday and apparently the signs had only just gone up. seems a shame. 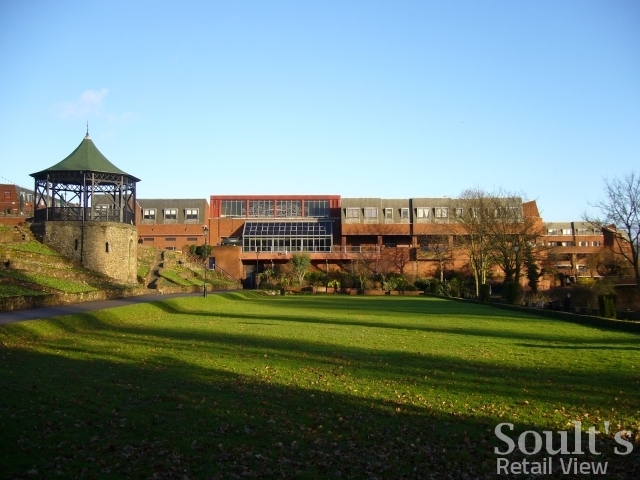 Soult's Retail View » Is John Lewis coming to Tamworth?